FC Barcelona failed once again to register a victory against the Russian side Rubin Kazan. That is quite an understatement, as Barca trailed for large part of the match. A first half penalty gave Rubin Kazan the lead but a second half penalty from Villa equalised for Barca. We once again had the most of the possession and had some seriously good chances to put the match to rest. But faile dto take any. With a 5-4-1 formation Rubin kazan's idea was to choke Barca and had to admit that they seriously managed it for the most part of game. Contrary to expectation Guardiola brought in Mascherano in place of Keita. We thus had a mmidfield of Xavi, Mascherano and Busquets and it was destined to lack creativity and it did show up throughout the first half. The defense had the now familiar look of Pique, Puyol, Alves and Maxwell. The attack had Villa, Pedro and Iniesta. The name Rubin Kazan does not invoke happy memories for Barca fans. Last season, they were the one of the few teams who managed to gain an upperhand against us. Even against Inter we had a record of two wins, 1 defeat and a draw. Rubin Kazan visited Camp Nou shocking us all with a victory, and the return visit to Russia ended with a goalless draw. That draw did raised doubts about our qualification chances. In the end Barca came out of the group on top is a totally different matter. Lionel Messi who was in doubt for this clash has got the all clear from the medical team. He has been included in the squad but is definite to start the match only from the substitute bench. It would be better if he does not play in this match. Guardiola would be pretty much happy with the effort put by his team at Athletic Bilbao. This is the third extremely difficult away visit we are making within the last two weeks. First it was to Atletico Madrid, then it was to Bilbao and we all hope this vist also end up with a similiar result. Rubin Kazan will present a considerably difficult challenge to Guardiola in terms of tactics. They are definitely going to be more physical than any of the opponents we have faced this season. More over Guardiola also hasn't have registerd a victory against them. FC Barcelona moved to second place in the La Liga table behind Valencia with a 3-1 victory at San mames. Real madrid's failure to win against levante presented us with a great chance to leap forward them. In a match which saw two red card (Amorebieta, Villa) goals from Keita, Xavi and Busquets secured Barca a vital away win in one of the most toughest stadiums in Spain. Now its has to be seen how many match suspension does Villa receive for his foul. After a not so great performance against Gijon, we got to see the real Barca back on the pitch tonight. Debates will be on about the impact of the Amorebieta red card on the game, but I firmly believed that we were good to win even against eleven men. Guardiola started Adriano in the left back position, the rest of defense was as expected - Alves, Puyol and Pique. The midfield saw Keita and Xavi joining hand with Busquets. The frontline saw Iniesta, Villa and Pedro. FC Barcelona will be looking to continue with their winning streak continuiing when they visit San Mames on saturday. Our last visit to San Mames did end up in a 1-1 draw, but the fans will be hoping this time the score resembles something like Bilbao's visit to Camp Nou. 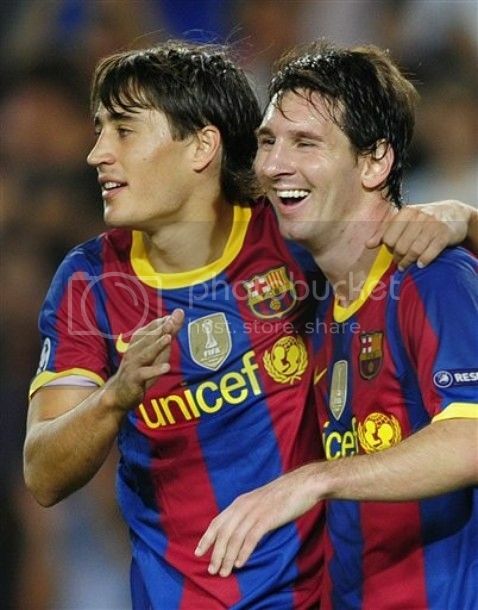 That match we won 4-1 (FC Barcelona -4, Athletci Bilbao - 1), with Bojan Krkic scoring twice. It was from that game Bojan started to appear as a genuine option for Guardiola last season. The kid will be hoping and definitely need a similiar effect from tomorrow's clash. He has been below par in last two matches and had to start turning it around as soon as possible. Again it has to be seen whether he get any playing time in this match. Athletic Bilbao currently lies at the seventh position with just two points behind us. With only just four match into the season, those statistics doesn't mean anything. The way this season is shaping up again it will be a dog fight between Barca and Madrid and for that every point matters the most. 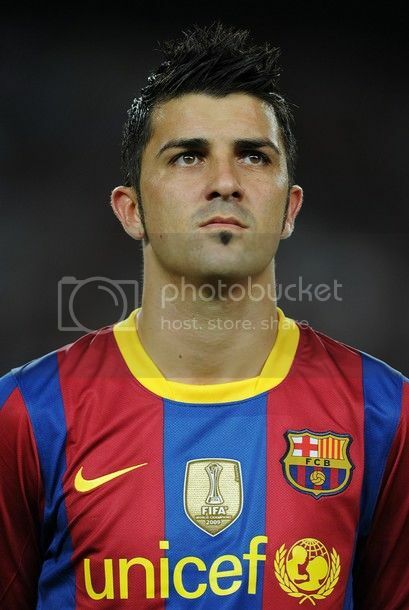 David Villa struck in the second half to help FC Barcelona defeat his former club at the Camp Nou. With Real Madrid winning yesterday this three points has to be considered more than valuable. After a goal-less first half, Villa struck ealry in second half to down a team with whom he tasted his first success. This was no way considered a clinical performance nor the usual silky and controlled Barca style, but still as I mentioned it is still three points won. We struggled to impose ourselves and that emphasized the importance of messi in the side. Xavi and Iniesta were once again below par and that is what worrying me the most. If they both are playing well then they will create chances for all, but that wasn't the case. Guardiola reshuffled his defense a bit - Milito and Puyol formed the centre of defense with Alves and Maxwell on the flanks. Busquets once again played the semi-DM, semi-CB role with Xavi and Keita completing the midfield. As expected Iniesta moved forward to provide a bit more experience in attack with the absence of Messi and formed the attacking trio with Villa and Bojan. FC Barcelona fans received a good news today with the club's medical staff confirming that Messi could be back in action in two weeks. After an MRI taken this morning at the Hospital de Barcelona, doctors have concluded that Leo Messi has a sprain in the internal and external ligaments of his right ankle, but confirmed that there is no damage to the bones. The early fears were of a fracture, but Guardiola confirmed yesterday itself that it's not the case. Lionel Messi could return back to action as early as in the Champiosn League encounter against Rubin Kazan. But that is definitely subject to the speed of his recovery. At this point Messi will definitely miss the matches against Sporting Gijon and Athletic Bilbao. Lionel Messi has been the inform barca player of this season and it to be seen how we cope with his injury. 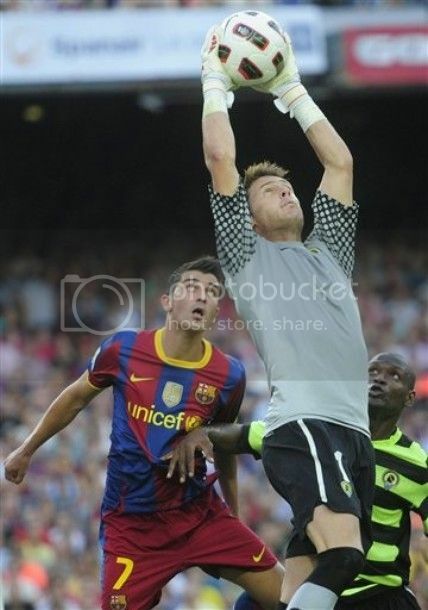 FC Barcelona won their first league match under Guardiola at the Vicente Calderon with a fighting 2-1 display. The hapiness of the victory was dampened by the scenes of Messi getting carried away in a streture towards the end after getting himself hurt by teh challenge of Ujfalausi. We have to wait for sometime inorder to access the injury. This is one guy whom we can't lose from this side. It was a spirited fight barca boys which gave them a truly deserved 2-1 win at the Vicente Calderon. As I wrote in the preview - FC Barcelona vs Atletico Madrid, it is always better to visit this stadium early in the season than late. Lionel Messi opened the scoring in the 13th minute before Raul garcia equalised. Pique restored the lead in the first half itself. With Abidal out of this trip, Maxwell was restored as the left Back. The rest of the defense remained the same with Pique, Puyol and Alves. The midfield as expected had Ineista, Xavi and Busquets. The attack had Messi, Pedro and Villa made up the attack. Latest Reports suggests that Messi may miss action for the next two weeks. It's considerably good news as we all feared much worse seeing his pain. FC Barcelona would be looking to avoid a second succesive league defeat tomorrow when they face Atletico Madrid at the Vicente Calderon. This trip for sometime have been a very unpleasant one. The last two league visit to Vicente Calederon ended up with away defeats. So the chances of ending up on Sunday night with two successive league defeats is pretty high. Atletico Madrid is currently is lying at the top of the table and I have to admit that this is the best Atletico side for sometime. But we still have to wait a bit to consider them as genuine title contender. Away matches against everyone has been always the problem for Atletico and the mid-week's Europa League encounter was no different. Atletico Madrid usually stumbles early on the season and then makes a late surge to end up in a decent position. But this season looks a bit different. But still its always better to play Atletico at the Vicente Calderon this early in the season. To all their attacking credibilities, they looked pretty vulnerable in defense. Kun Aguera, always a thorn for Barca is struggling with his fitness and is in a race to be fit for this match. But I have a feeling that he will be there from the start. Normal service were restored at the Camp Nou with an emphatic 5-1 victory against the Greek Champions. The match's importance grew following the 2-0 dfeat at the hand of Hercules. This also had its fair share of twists with the Greek side taking the lead in the 20th minute to leave Camp Nou stunned. Barcelona responded well and have to say that Barca could and should have scored more goals. Panathanaikos didn't have the defense to hold back this Barca side and even though they went ahead, it was just a matter of time Barca over run them. Guardiola decided to do away with his experiment and fielded his best eleven as I predicted in the FC Barcelona vs Panathanaikos Preview. Messi undoubtedly once again was the man of the match with two goals and would be very dissappointed in missing the penalty. The other goalscorers were Villa, Pedro and Dani Alves. 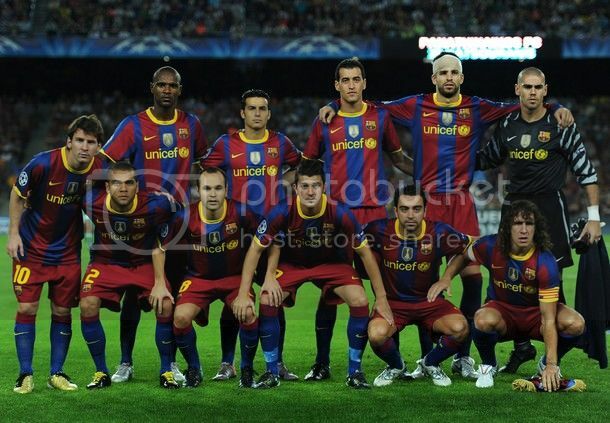 We had our best defensive line-up for this match with Alves, Pique, Puyol and Abidal as the back four infront of Valdes. The midfield had Busquets, Xavi and Iniesta. The three men attack saw Messi on the right, Pedro on the left and Villa in centre. FC Barcelona starts their Champiosn Leagu campaign at the Nou Camp against Greek Champions Panathinaikos tomorrow. After the 2-0 defeat against hercules, it could be thebest thing the players can ask for. A match this quickly means Barca has the perfect platform to bounce back and turn the topic away from that defeat. In that sense, it is essential for Barca to win this game preety well. Nobody expects Barcelona to lose back to back match at the Camp Nou, so we should see the players more determined to produce a perfect performance. Onething the defeat against hercules taught us is that there is a heavy price to be paid for being complacent. Sport.es has reported that Guardiola is angry at his players and did let them know about the same after the defeat. But many of us is actually angry at Guardiola for trying non-sense thing. I sincerely hope that sanity returns to Guardiola abd he learns from the blunder he commited. But knowing this man, I have a belief he will never learn from his mistakes. Hercules club's victory over FC Barcelona has to be the biggest upset of recent times in European football. The surprise factor became bigger considering the fact that it did took place at the fort of Camp Nou, on one of the most important day in Catalunyan calendar. Most of us have still not come to to terms with the defeat. It was the stellar effort from Valdes which helped Barca escape with a 2-0 defeat and that fact makes the defeat even more worse. This has to be the biggest defeat Barca has faced in recent times. We have sufferred more bigger defeats but those came from sides who had a serious chance of defeating Barca. Hercules recent addition did make them a tricky opponent but still our boys were expected to stroll past them Instead they bulldozed us to a memorable 2-0 victory. FC Barcelona suffered their first defeat of this years La Liag season at Camp Nou infront of an almost packed house. Let's just hope they don't do this often as we may not be able to afford the same. The team can be rated as a 5 out of a scale of 10. So let's get to the business straight away. 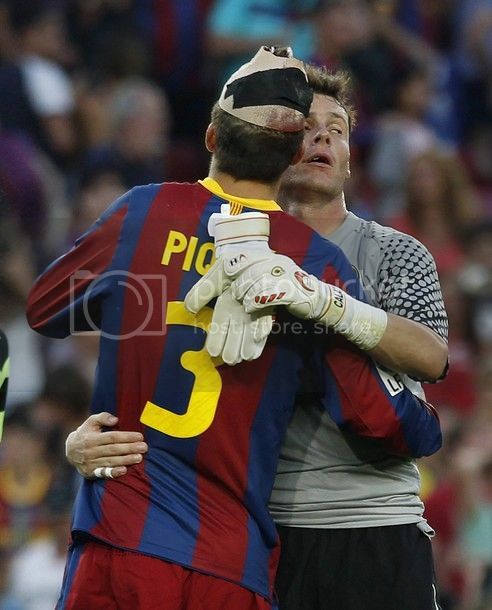 Victor Valdes - 8 - The Barca player on the pitch. He would have been hoping to have a quite laid off night, but ended having a pretty busy one. Couldn't have done anything on the two goals. Made quite a number of unbeleivable saves and he was the reason why the socreline was kept at 2-0. Newly promoted Hercules made a mockery of the attacking talent Barca possessed by dominating a match and winning it quite comfortably. This was suppposed to be a cake walk and I myself predicted a 5-0 drubbing tonight at the Camp Nou. Instead Hercules gave an astonishing drubbing to the defending champions. In my preview I did wrote about the usual troubles we face adter an international break. But don't blame FIFA for this defeat, it is all made by one man - Pep Guardiola. In a way this is not a surprise defeat, as Hercules has done this to Barca when last time they were in the top flight. Barca B, who played at the same time went down at Cartegena 4-1, but that could never be considered as a humiliation. In my preview I argued heavily on not using Abidal as a Centre-Back and giving Mascherano the start. My fears were proved right with some awful performance. I will come back to that later. FC Barcelona would be playing their first home match of this season tomorrow against newly promoted Hercules. Usually coming back from an international break is a bit worrisome for Barca. But Guardioila will be happy playing hercules rather than any other team. Hercules went down to Athletic Bilbao on the opening week and was not expected to create any trouble for Barca. But the recent acquisition of Drenthe and Trezuguet have made them pretty competitive and couple with our usual problems after an international break, this could be tricky. Many of the FC Barcelona players had a mixed international break. Spanish stars like Iniesta, Pique, Busquets, Pedro etc would like to forget the 4-1 drubbing at the hands of Argentina. Meanwhile Messi and Milito should be pretty high from that win. Milito is expected to start the match as Puyol is still not match fit. Teams like Hercules should be an ideal platform to give the youngsters a go. Jonathan dos santos and Thiago is expected to get some playing time. This year's Ballon d'Or would be one of the most contestly fought contest in recent years. The front runners of this years award are Andres Iniesta, Xavi hernandez, Lionel Messi, Diego Forlan and Wesley Sneijder. The Ballon d'Or and FIFA World Player of the Year award has been merged from this year and has been Christened as FIFA Ballon d'Or. The inaugral award already has raked up enough interest, with everyone linked with football making their choice heard. Jose Mourinho has backed Wesley Sneijder to bag the award whereas the FIFA World Cup Golden Ball winner Forlan has backed Xavi Hernandez to win it. Mourinho in his typical arrogant fashion has dismissed Andres Iniesta, despite an excellent World Cup campaign, topping it with the Winning goal. Diego Forlan had a great World Cup and led his under achieving club side to UEFA Europa Cup, but fails to impress the "The Controversial One". Meanwhile Messi with a whopping 47 goals in all competition is expected to retain his title, eventhough a weak World Cup Campaign is going to act against him. Barca Atletic boys continued their winning start with another 2-1 victory over last season Preimiera Liga side Xerez.Below is the highlights. It was great to see Barca making a winning start to a new season. Maybe it became much more sweeter with Real Madrid dropping two points on the opening week. Two points lead at this stage is not much but it may help in increasing the pressure on Real Madrid and their much celebrated new coach. The match itself saw quite a strange starting line-up. But it may be a sign of things to come. Many Barca fans have gone over board with their praise for the team. But for me the first half of the match was extremely poor. We were lucky enough to get an early break and then the second goal also was from the Racing custodian's mistake. We got the goals at the right times and that means that were were never troubled throughout the match. One have to admit the fact that Racing was a very poor in the match and lacked seriously interms of creativity while going forward. i haven't seen a match in which Barca players miss placed so much passes in the first half. But then we have to admit that its the first match of the season and thing will definitely get better once more games are played. The good news is Messi looked absolutely brilliant and that should remove all our anxieties. I honestly can't believe that I missed so much of action at Barca. Been away for sometime with some work. Let me first apologise to the regular readers for not updating the blog.Eventhough I was tracking each of Barca's event, never got substantial time to pen down my thoughts. The last time I wrote was about the nonsense of Cesc pursuit and am delighted that it atleast ended for the time being. But there is no let up in on field and off field action at Barca. Now the latest is the Ibrahimovic story getting evolved wonderfully. No idea how this happened to develop into such a mess. Let's come back to that later. First the most brilliant event of these weeks - the astonishing comeback by Barca in the Super Cup. I have to admit that i didn't believe that we will overturn the 3-1 deficit from the first leg. First of all, most of the first team players were vacationing after a long World Cup campaign and weren't in the best frame of mind and the last time we were down 3-1 in a two legged tie we failed to overturn the deficit. But this time it was different. As far as the victroy at Racing is concerned, I think I might write an entire post on that match.